Email: Send HaliBURD an email. 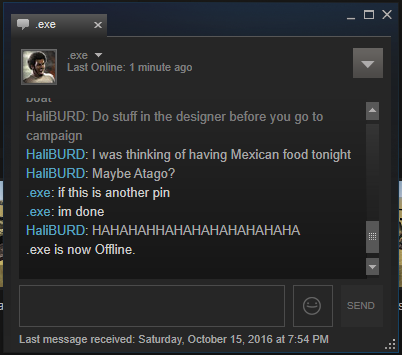 Private Message: Send HaliBURD a private message. Bio: Resident Moray Enthusiast hyar! I build primarily airships but I also work on land vehicles and structures. I lurk on the forums seeing what airships and replica ships I can scoop up and admire. Builds using wood and really only wood. Wood is laif, wood is bae. I like to work on anything airship-isq so don`t be afraid to ask for coops or requests! + That I just need to BAYERN them away~! - Man, my puns are that bad, huh? - I have a poor sense of humor?! + I`m going to TOWN with these puns! + TONE it down a little? - you're gonna need to TUG me away from my keyboard for me to stawhp! - Forgive me if I come up with some DARING puns! - On the BATTLE-field of puns, ship puns are my only WEAPON! - This SCHOR is a great time, huh!? - I bet you guys are thinking that ISOKAZE! - My mother once told me that I was a blooming FLOWER of puns! - I got so much puns, that you can compile them and still have enough for a sequel called the REVENGE of the BIS! - Stick with my folks! We are almost at the MIDWAY point! - Man thinking of how all of you must be groaning from these puns makes me wish to HIRYU! - I ever tell you of the last time I went on a pun-page? I almost lost MAHAN by the end of it! - Man, I bet when the streak of puns ends it gets all ERIE since it may be over! But these TERRIBLE puns are IMPLACABLE, no INVINCIBLE! And they are most ILLUSTRIOUS indeed~! Also loves making things fly..... Even if they really shouldn`t. Makes the dirtiest, grimiest, Cringeworthy ship related puns ever.